You have been persuaded out of retirement by a mysterious person with an offer you just can´t refuse: Travel around the world and find one-of-a-kind souvenirs for a collection. With a sharp eye for the unique, you´re off to visit amazing locations like Tahiti, Australia and Morocco! Visit vibrant and exotic destinations to find these carefully hidden items. Get help from power-ups including flash cameras, and new level-specific items such as a helpful platypus in Australia. 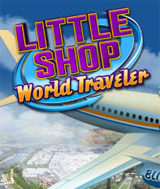 Together with the manic Blitz mode, the "Shake It" bonus rounds and of course, collectible trophies, this will be the biggest Little Shop adventure yet. Comments: If you like HOG games please try this one, not boring and is quite fun! Comments: I really love this hidden object game.